Spotted this unusually small Arhopala (much smaller than major) from afar so the muta subgroup immediately sprang to mind. Just as I was nicely in parallel, it suddenly and unexpectedly opened up to reveal it's dorsal so i had to hastily readjust to snap a few shots before it took off. Forever. I never saw it again at this same spot. After checking with various sources, i'm thinking this is likely A. moorei busa. 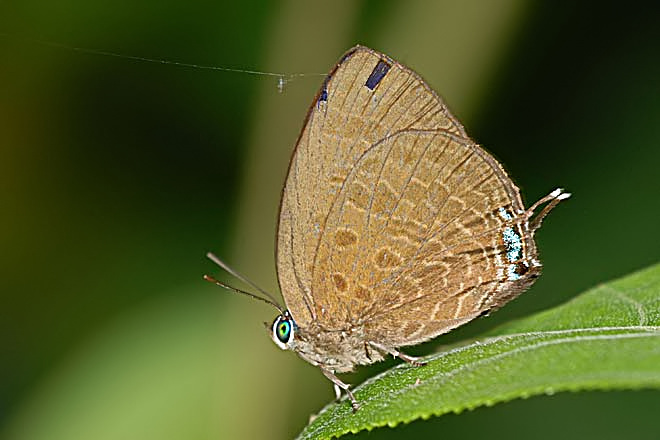 The females of muta and antimuta in Butterflies of Borneo don't match. Thoughts? The rounded border of the FW blue is seen in A. muta & moorei & A moorei have the wider border. However, the female of several tailless species also looks similar. I too suspect the Wiki specimen to be mis ID;ed. ON closer look the FW spot 4 is not dislocated from spot 5 above it indicating it is muta/moorei. Those greenish blue scales suggest muta female as the moorei is more purple. The width of the border is not used to separate the females of muta & moorei. Here is the correct A. hypomuta;FW spot 4 is clearly dislocated & shifted out. 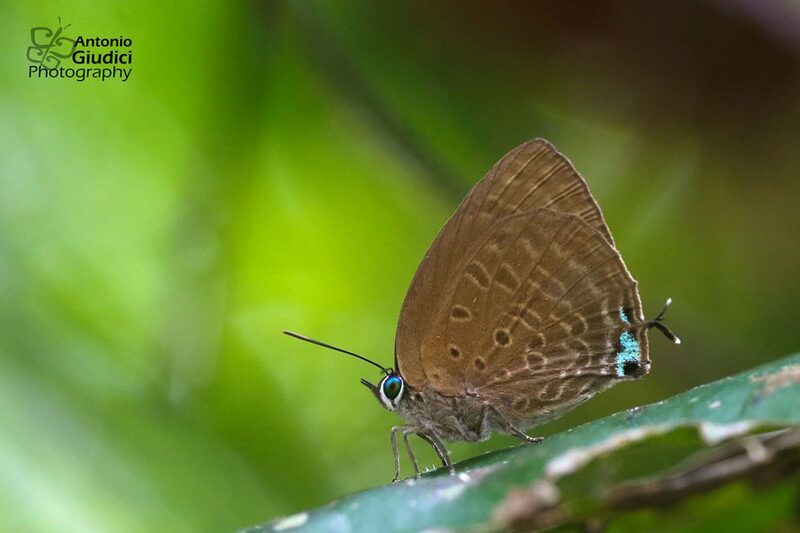 The presence of the HW basal spot 6 is variable; it is said to be usually absent in Borneo examples. A. hypomuta is probably still extant in Singapore as I have seen a set tailless female with very broad borders long ago. Two others of interest, both I think from USR. by Federick & Sunny. Even without the basal spot in space 6, A. hypomuta has a somewhat "different" appearance overall due to the curvature of the outermost markings formed by the spots and should be quite distinctive. Dr Seow i think the one IDed as A. delta is actually A. allata pandora. The post-discal band is not as dislocated as it should be in delta. The A. agrata is another amazing find and also one that i'm trying very hard to find since it's also one of the more distinctive spp. that can be quickly verified and added to the checklist. Federick was very lucky on both occasions! You may be right here but it is really hard to tell. I did look at this over the years but is uncertain. A. allata :FW apex sharper & termen straighter; FW postdiscal typically intact & straight, but may be crooked at v4; HW spots 6 & 7 usually narrow & rectangular;HW submarginals, margin less protruding. A. delta; FW termen more rounded , & greater costal curvature (more convex) FW postdiscal variably dislocated at v4; HW spots 6 & 7 more rounded. There are hardly any shot of A. delta though Fleming state A. allata is the rare one. All times are GMT +9. The time now is 09:42 PM.